A year ago today, Jerome and I left on our big Asia Adventure, and I've been thinking about all the crazy things we did and that happened recently, and I realized that I had never completed the last few posts. So I'm going to write up an abbreviated account of our last few weeks to complete the record, and for you to enjoy hopefully. Our last post left us in Bali, being trapped by the volcano ash cloud for several extra days. 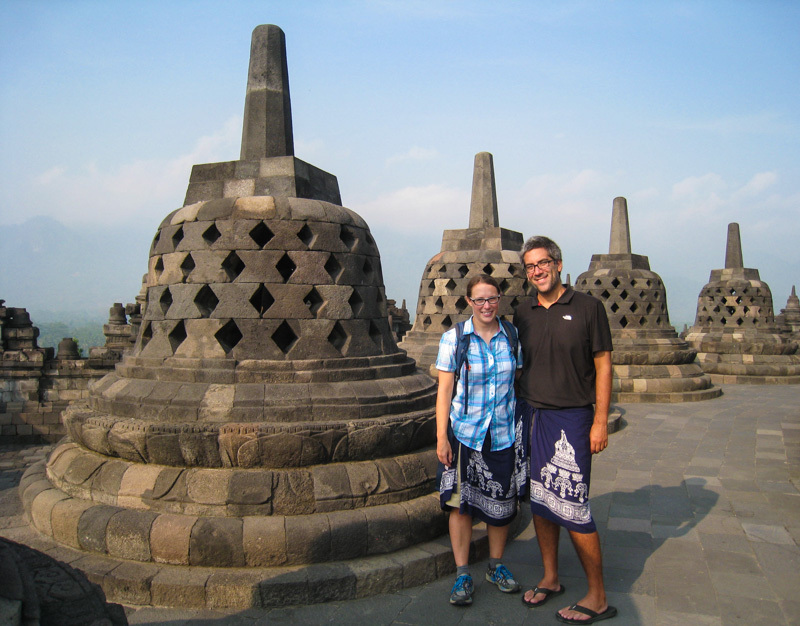 This meant our stay in Yogyakarta on the island of Java was cut from four days to only one! Luckily, this was just enough time to take short visits to the two temples we wanted to see there. Borobudur and Prambanan. Both are Unesco World Heritage Sites. Borobudur is a 9th Century Buddhist temple. It had very interesting bell shaped formations on the roof that each held a Buddha. 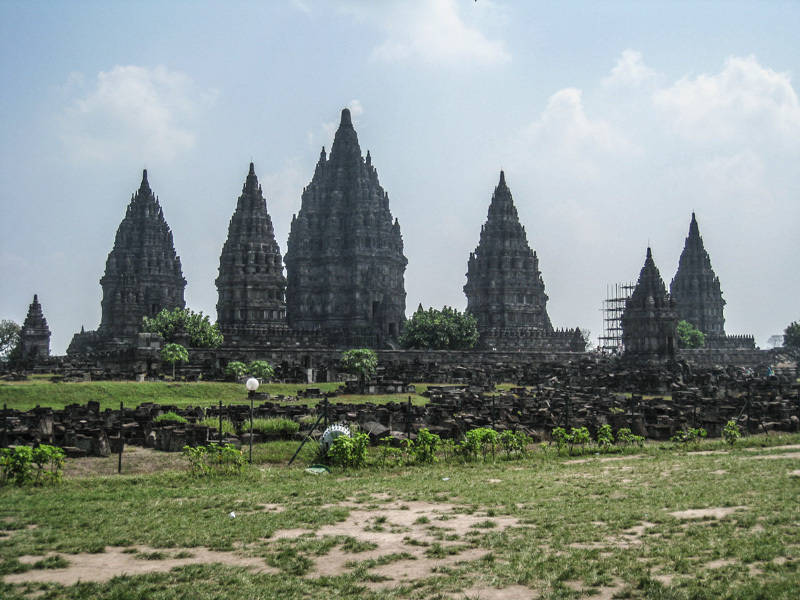 Prambanan is a 9th Century Hindu temple. It has a very different construction, shape and layout. 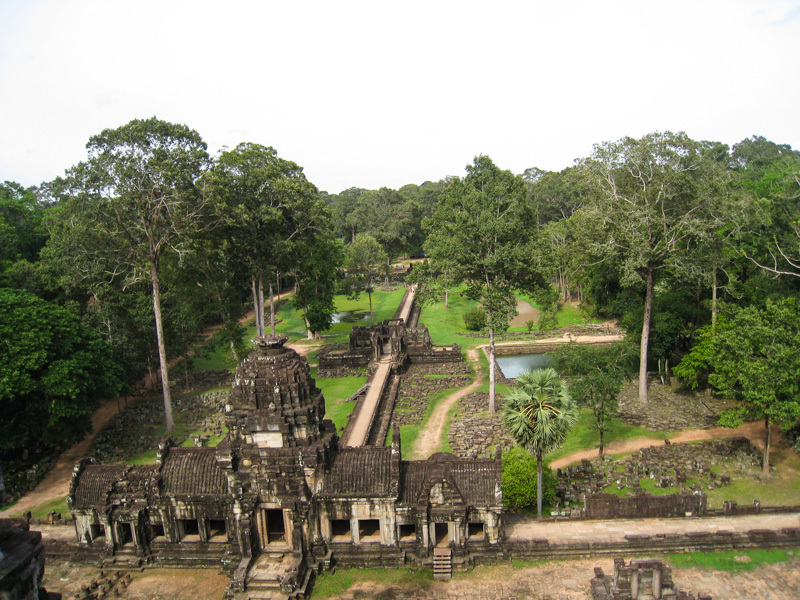 It was really interesting getting to see the two temples, made during the same time period, but be so vastly different. 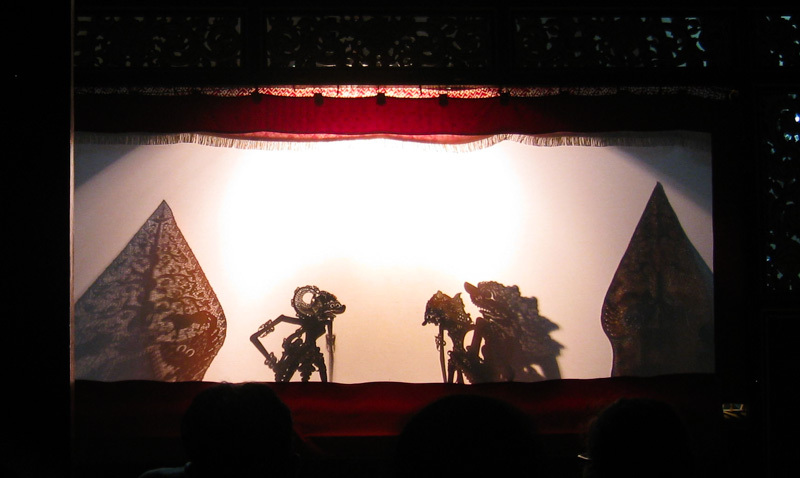 We had just enough energy that night to go to a traditional Javanese Shadow Puppet Show, called Wayang. This art form is also designated by Unesco as an important cultural heritage. The puppets are hand cut from raw-hide, and intricately painted. The show was a traditional story, with a single puppeteer and a group of Gamelan musicians accompanying him on traditional percussion instruments. The show was very interesting, there were chairs on both sides of the screen, and you were free to move between the side where you see the shadows, and the side where you can see the puppeteer and musicians at work. 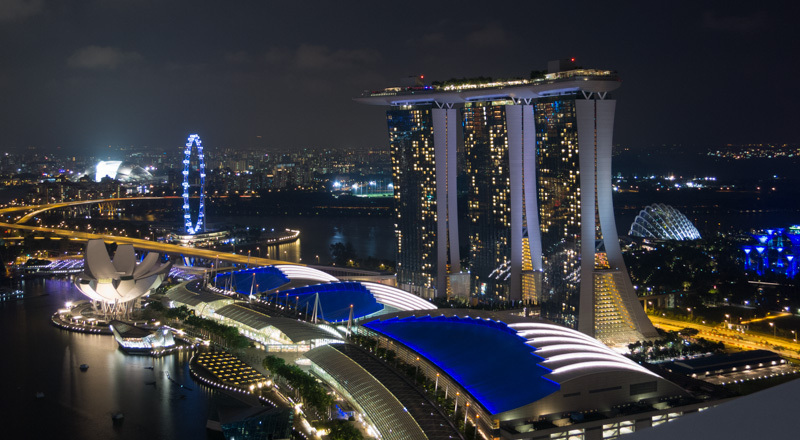 After our crazy full day in Yogyakarta, we headed to Singapore. We cut our time here a bit short in order to do our Maldives Liveaboard, but still had plenty of time to explore and eat all the food on our list! I won't bore you with all the food pictures and items we ate, just a few. 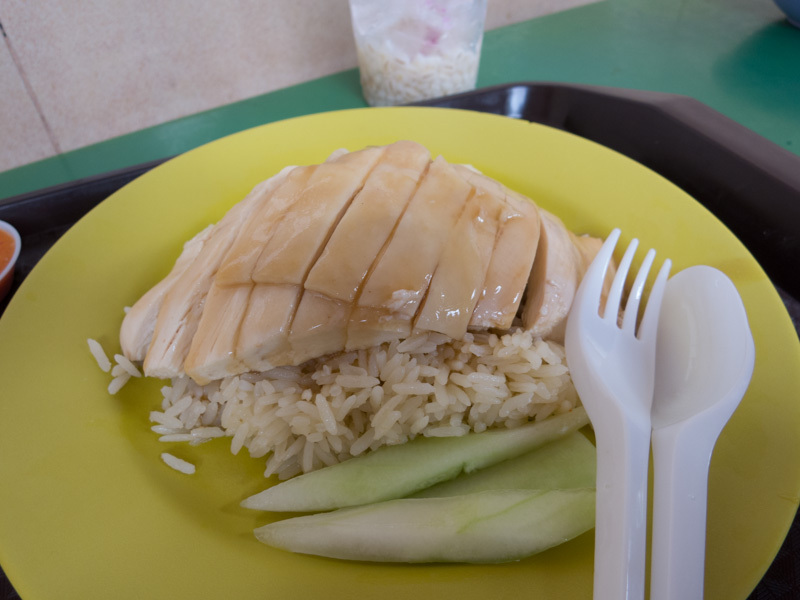 We started by heading to the famous Maxwell Food Centre which is a well known "Hawker" Centre where there are over 50 food stalls each specializing in different and amazing food for pretty cheap. We at the famous duck rice, which was amazing, and several other tasty dishes. Even sharing we got too full to try all the items we wanted to! 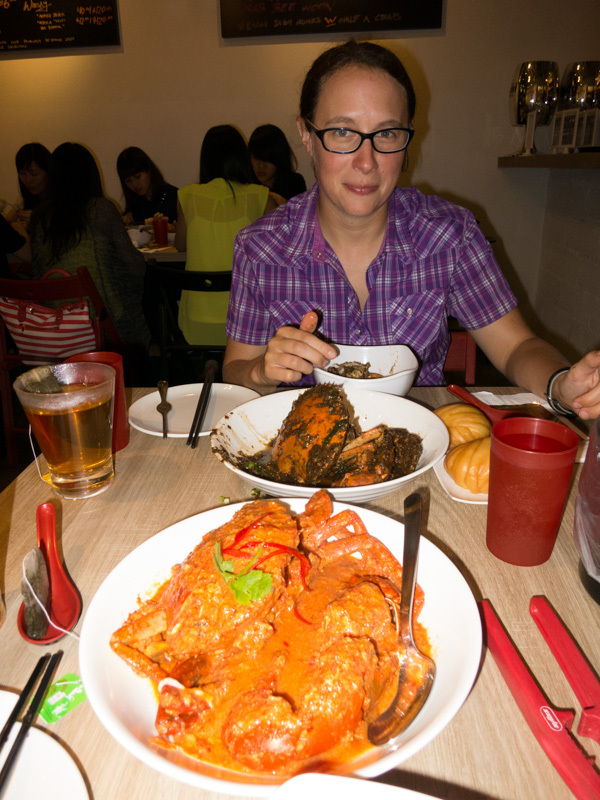 Another food highlight was the Pepper and chili Crab we had at Momma Kongs. 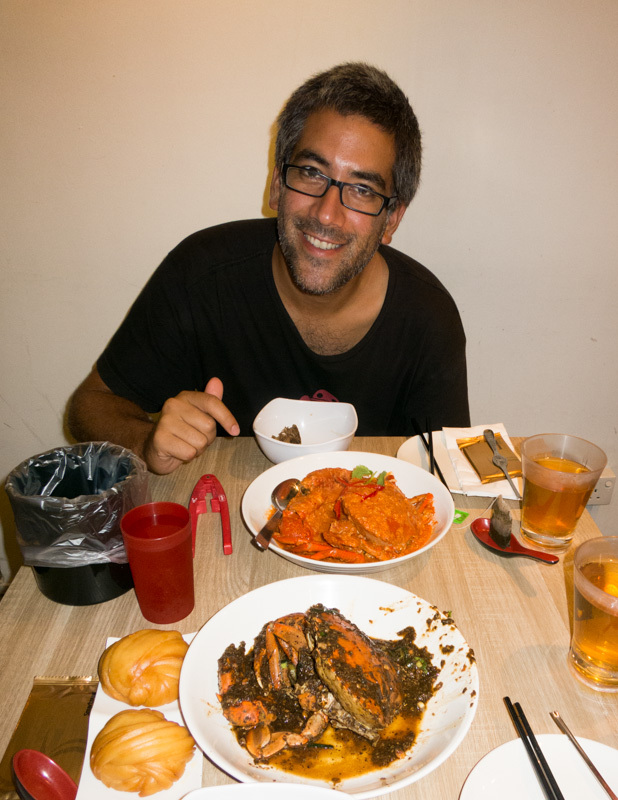 Which boasts having "The island's best chili crab!" It was delicious!! 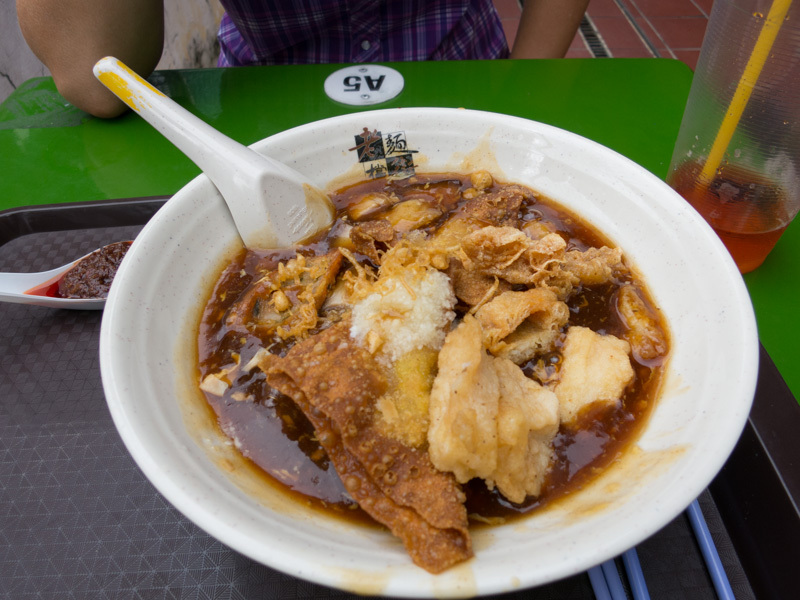 Most of our time in Singapore was spent walking around the city, and stopping here and there to eat. We also bought a new camera to replace the one that Jerome drowned in the ocean. We went to all the different areas like Bugis Street which is a giant store, the electronics mall area, and the neighbourhood where Jerome's Grandparents lived and he remembered visiting when he was small. One afternoon for a break we stopped by an interesting tea shop and had traditional Chinese afternoon tea. It turns out the Queen has had tea there, so we felt in good company! 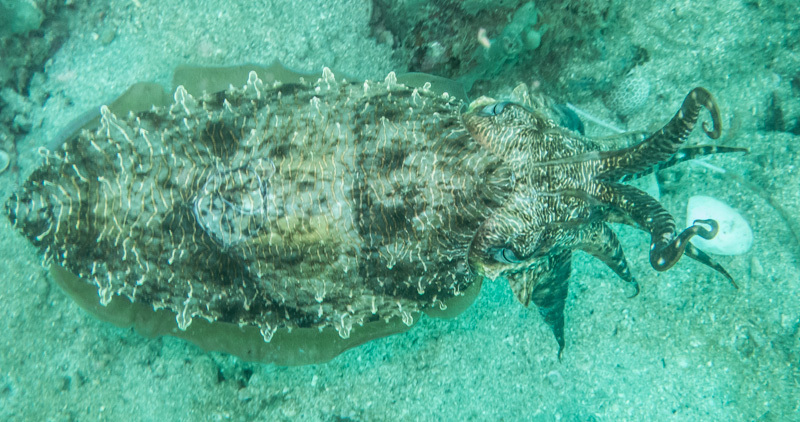 Between Singapore and Cambodia is when we went on the Maldives Liveaboard, which you can read about here. 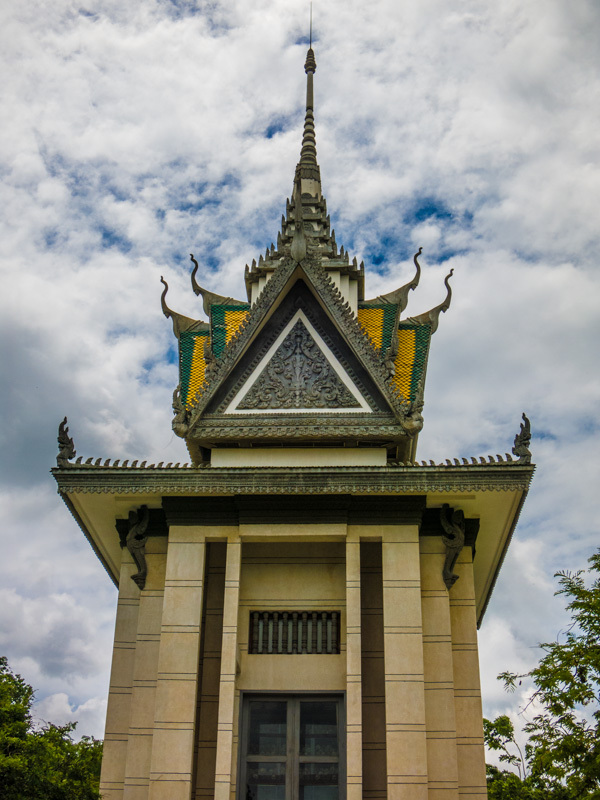 Our next stop was a few days in Phnom Penh. We don't have a ton of photos as most of our time was spent visiting and learning about the sites of the atrocities of the Khmer Rouge, where it didn't seem right to take photos. It was very sad and disturbing, but worth learning about, since neither of us had heard or knew a lot about what went on in Cambodia during that time before. We went to a traditional Cambodia restaurant called Romdang which helps street youth learn to cook and be servers to get off the streets. They have lots of traditional fare there. 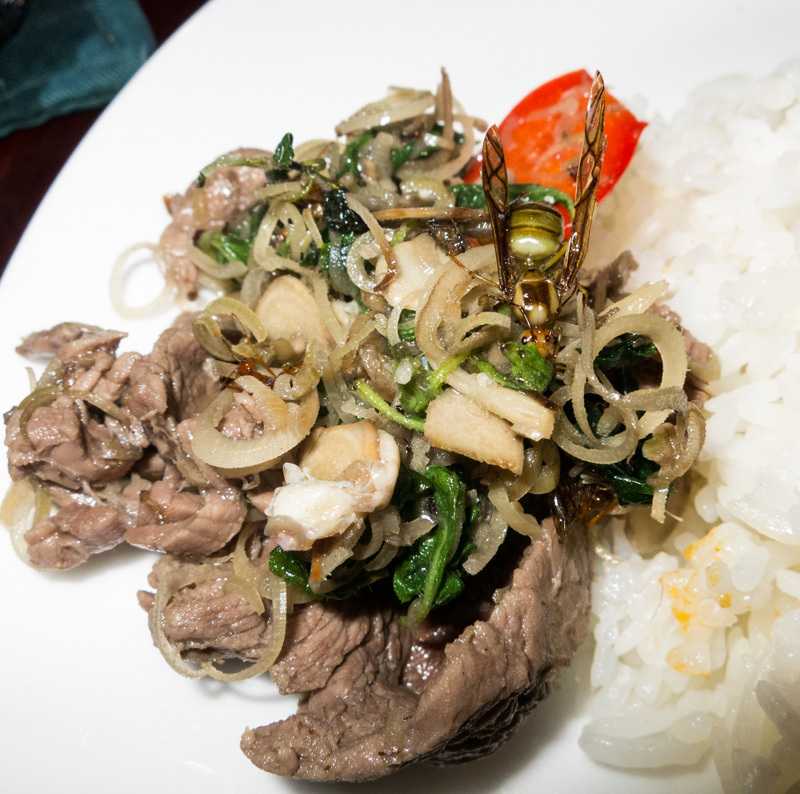 We were a bit adventurous and tried the Red Tree Ants with Beef and Basil. If you look closely, you can see a few in the photo. You mostly didn't notice - unless you got the big winged ones, and they had an interesting sour flavour to them. We weren't brave enough to try the deep fried tarantulas like the people at the table next to us though! From Phnom Penh we headed south to the coast to Sihanoukville. There we spent a night on a Liveaboard and did about 5 dives. The boat was quite basic after our Maldives experience, but fun except for the big rainstorm during the night! 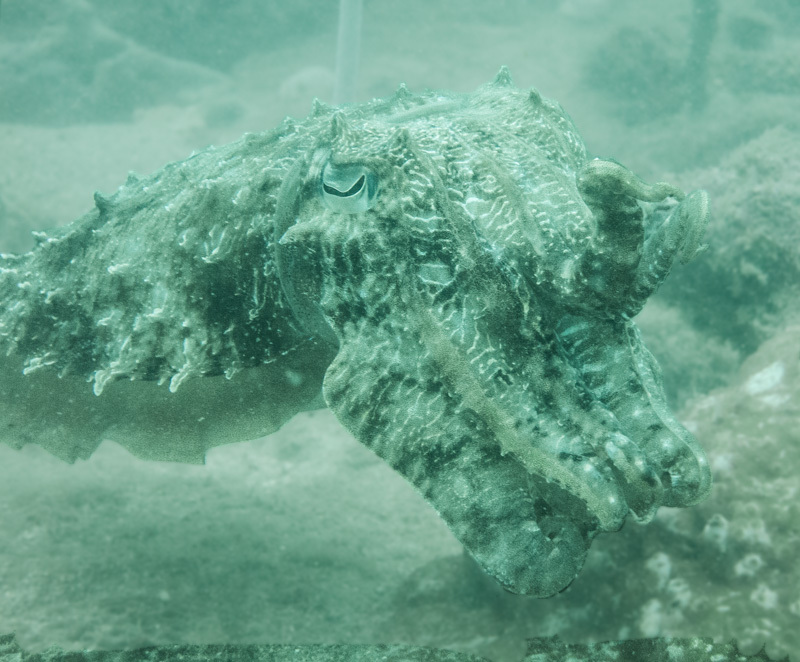 The water was a lot less clear here than the other places we dove, but there was some really neat colourful coral that we'd never seen before and lots of neat fish, like this beautiful and bizarre cuttlefish who hung out with us for a while. We were also supposed to go stay on a remote island nearby for a few nights, but a giant rain storm moved in, and after our last remote island experience with the cockroaches, we decided to stay dry and bug free, so we extended our stay in town, and just relaxed and read and watched movies for a few days. We tried to do another dive, but the boats weren't even going out, so we knew we'd made the right call by not heading to the island. From Sihanoukville we flew to Siem Reap, which was an adventure with the rain causing delays, us being diverted back to Phnom Penh, and eventually getting there 6 hours later (it should've only been an hour!). 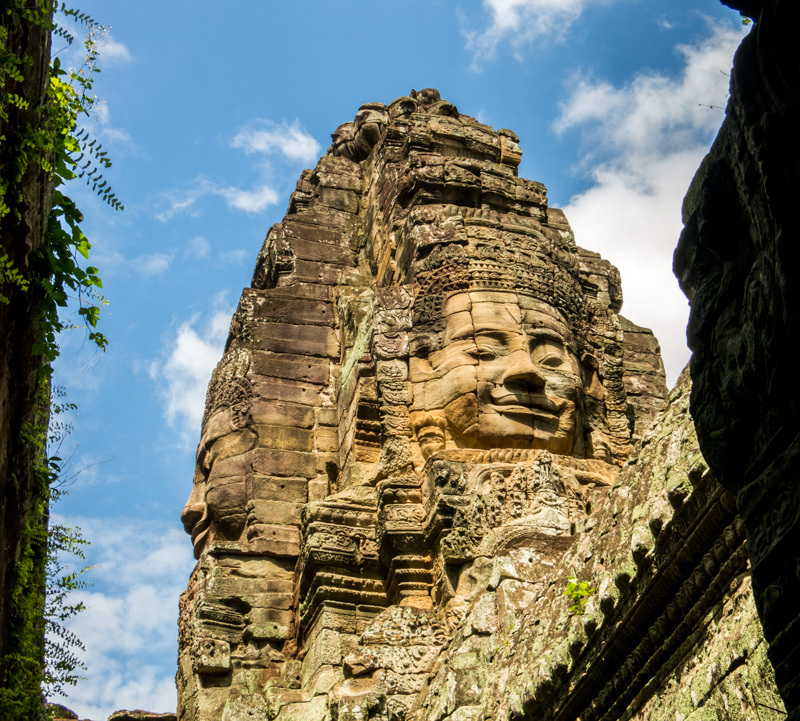 We had a week booked in Siem Reap to visit the city and all the temples. 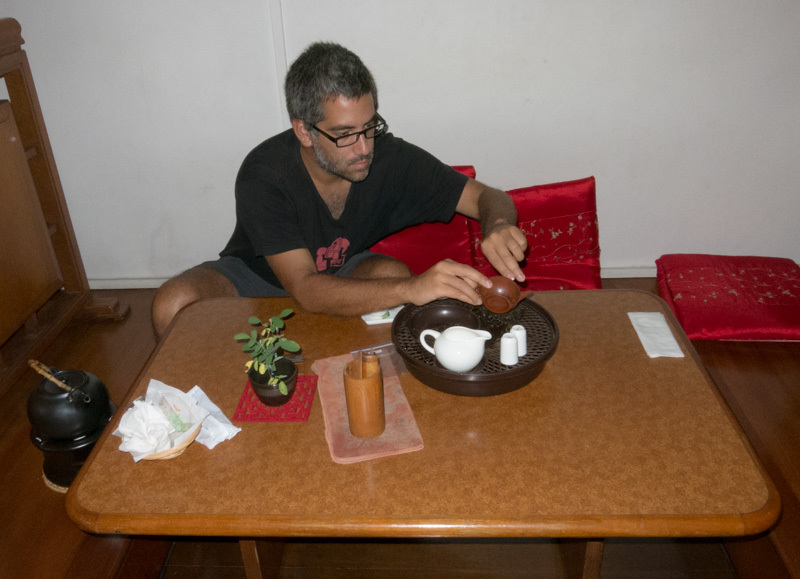 We alternated days of visiting the temples and relaxing at the hotel and in the pool. It was insanely hot and humid, and walking around the temples wore us out pretty quickly in the heat. Plus we found if we tried to do too many in one day, they blurred together. Jerome's that little green person in the doorway! It was quite interesting seeing all the different styles of temples and learning what they were all built and used for. Quite amazing thinking about how long ago they were all built! It was also interesting imagining what they all must have been like at their peak glory full of people. 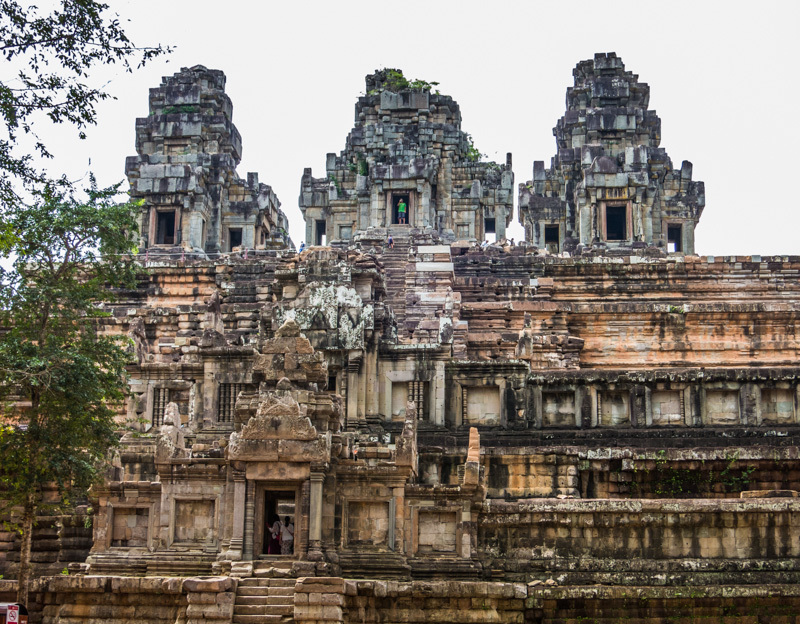 This was Ta Phrom - now known as the Tomb Raider temple from the scenes in the movie. They've fenced off all the areas that were shown as everyone wants to take their pictures there. 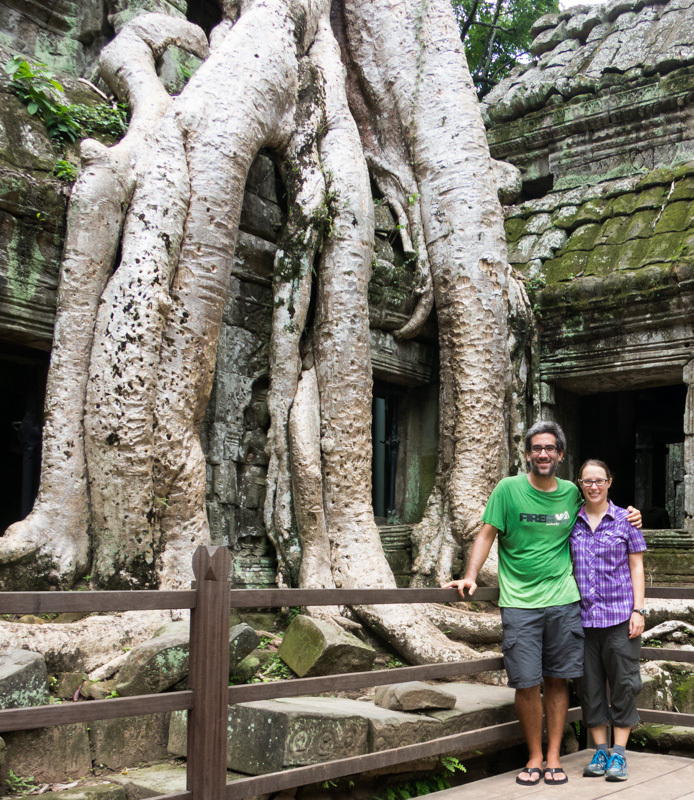 It was a pretty cool temple in general with the giant trees growing right through the walls and roof. One afternoon for a break we went to play mini golf. It was a lot of fun. 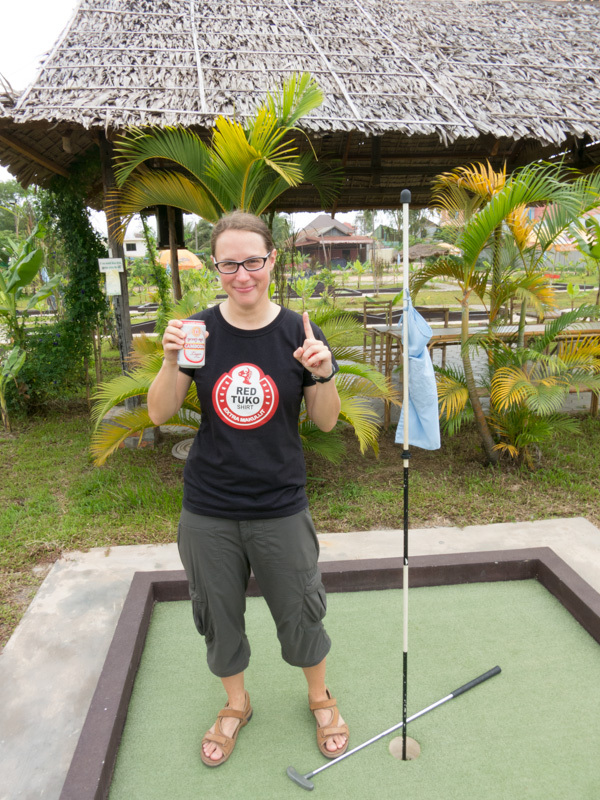 I got 3 holes in one! And won a beer for each! Jerome got the lowest score total, but I think we all know who really won! 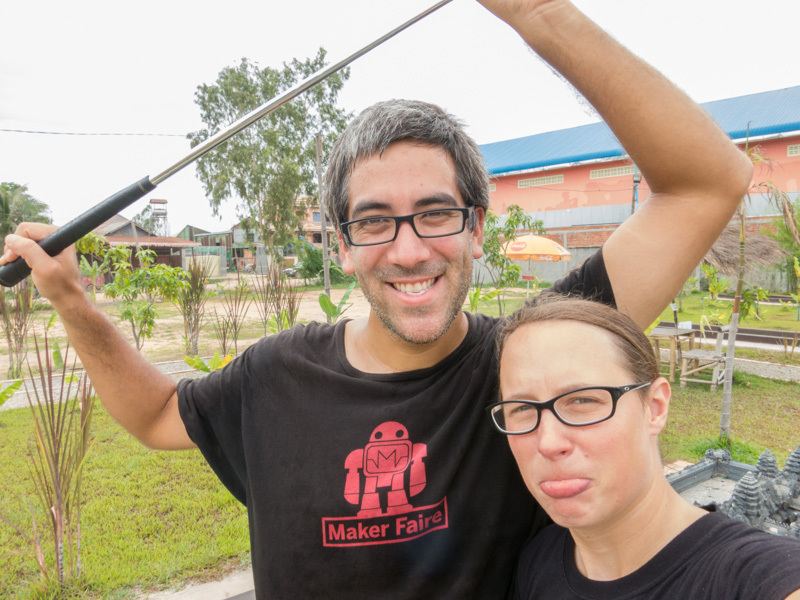 We left Cambodia and headed to Hong Kong for a day before our flight home. We explored the beautiful waterfront at night, went to the top of Victoria Peak and admired the amazing views, went to a mall in the shape of a boat, had Michelin Star Dim sum, walked through the goldfish market where we saw a fish bite holes in it's plastic bag, and a turtle escape it's bucket and make a run down the sidewalk! On our last day, we packed everything up and went for some Szechuan food for lunch. We bought some treats to bring back for our friends and then headed to this tea shop Jerome had found. 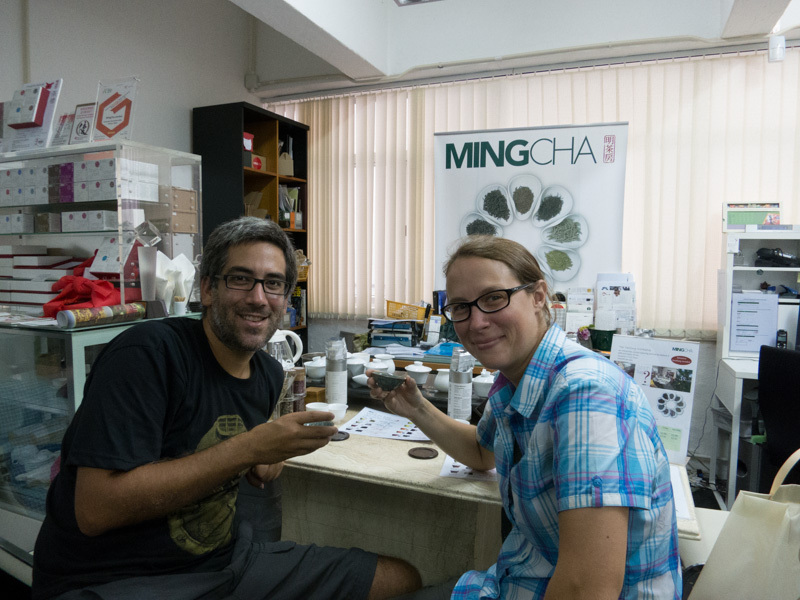 We spent a few hours trying and learning about various teas. Had a quick dinner, and headed to the airport for our long flight home. Overall it was a truly amazing adventure, which I'm so grateful we were lucky enough to get the chance to do. There were some ups and downs, but it was truly memorable, and I think of the things we did often. Jerome and I both agreed that we enjoyed this trip a bit more than our Europe trip. Mostly because of the greater variety of activities we did, instead of mainly just visiting cities and site-seeing. I mean we climbed a mountain, explored the jungle, did over 60 dives, were stranded on a deserted island, trekked through rice fields, and of course ate lots of great food! It'll likely be quite a while before we do any more big travels, but are so glad we did these ones! Thanks for coming along for the ride with us!